Sat 1: When the train arrived at Newhaven Harbour station, I pressed the button on the rear carriage and the door didn't open. The door into the next carriage didn't open either, and I feared I was going to be left behind. The guard yelled down the platform that I should use his door, so I ran up and climbed aboard. His excuse was that "the book" said only the front four carriages fitted into the platform. Sun 2: I went to the Angel Canal Festival but it was really busy, because that's what happens when you hold a festival on a towpath. 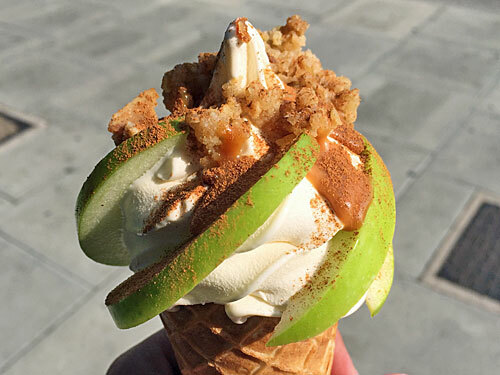 Mon 3: I went back and bought an 'Apple Crunch' signature cone from Bears Ice Cream in Starch Green. They sliced the apple specially before sprinkling everything with salted caramel and cinnamon, and it was delicious. A passer-by enquired where I'd bought it, then jumped onto a number 94 bus through the middle doors without paying and smiled back at me. Tue 4: I'm never sure if the council are actually going to turn up and collect my recycling bags off the pavement, but they did, so that's good. Wed 5: The pharmacy had my tablets, which was a relief, because I no longer quite understand how their automatic renewal/reordering procedure works, and usually end up standing there looking like an idiot. Thu 6: Wow aren't the Malvern Hills amazing? I don't think I'd seen them properly before, but there they were from the train, this big sticky-up ridge in the middle of nowhere. I bet they're amazing to climb on a good day, and I have added them to my longlist of UK places I must visit before my legs give out. Fri 7: Tesco had Lemon Drizzle KitKats on special offer, nine for £1, so I bought more than one packet. This is why I still prefer buying in person rather than online, because otherwise you miss these bargains and end up paying full price for the usual Wagon Wheels or mint chocolate Clubs. 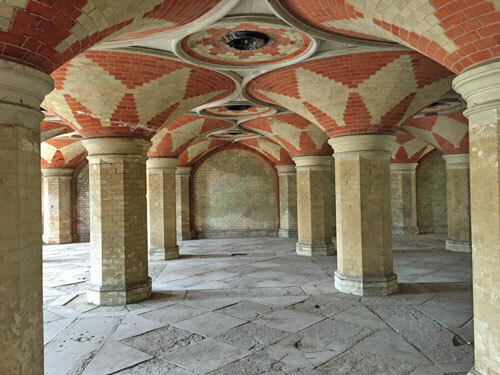 Sat 8: The Crystal Palace Subway is properly amazing, isn't it? The vaulted brick pillars under the A212 are stunning, even if they are an iniquitous remnant of unequal provision, provided solely for first class travellers exiting the former station. By visiting late on the Open Day there were no queues, hence better opportunities to take people-free symmetrical photos. Sun 9: I don't normally sit in the Costa outside Harrow-on-the-Hill station watching other people drink tea, but today I made an exception. Mon 10: I decided this would be the ideal time to catch up on a couple of programmes I recorded over Christmas while I was away in Norfolk, if only to release some disc space for when I do the same thing this Christmas. That M. R. James knows how to unnerve. Tue 11: My hard drive, on which I rely for the storage of 10+ years of irreplaceable photos, has started intermittently disconnecting itself from my laptop, which isn't ideal. How often we only realise the importance of additional back-ups after the horse has bolted. Wed 12: Although it looks like there's a pavement alongside the A13 behind Poplar station, it doesn't lead anywhere and peters out at a No Pedestrians sign before the tunnel, and you have to walk all the way back to Blackwall. Thu 13: My eldest nephew has somehow managed to reserve a flat in a new development in London, even though he hasn't seen it yet, so today my brother and I particularly enjoyed being shown round by the saleslady, and admiring his surfaces and especially his views, then sending him lots of photos afterwards. I hope the trains don't keep him awake at night. Fri 14: I have new neighbours. It's always a toss-up every time a new lot move in whether they're "go outside to smoke on the balcony" types, and I fear this lot may be the full-on weed contingent. Sat 15: It turns out that the Royal Society of Sculptors' HQ at Dora House in Kensington isn't particularly worth crossing London for. 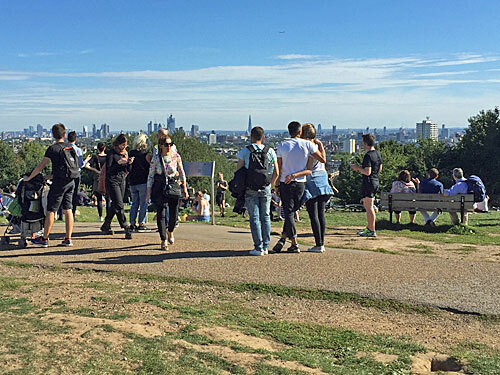 Sun 16: Some days only a good walk across Hampstead Heath will do, from the kiteflyers on Parliament Hill across the grassy humps and through the woods to the heights of Kenwood, then exploring the undervisited reaches of Sandy Heath before a spin round Golders Hill Park. Mon 17: That fish and chip shop on Roman Road I said I'd go back and sample still has a sign outside saying "Back in 2 weeks", so I assume they've closed permanently. I went back to the Saucy Kipper instead, and theirs is still deliciously tip-top. Tue 18: Today on the footpath round the North Greenwich peninsula; a lot of hoardings, a muddy beach covered with gulls, wobbly bikes, a splendidly empty section along the dockside, and sheesh haven't they reopened that section of path past Enderby Wharf yet? Wed 19: I wish everyone didn't keep stealing trolleys from Tesco, because there are never any out front when I need one. This time I'd scarcely packed everything away at the till when a lady approached and offered a quid for mine. Thu 20: Some years getting the Gold Card discount added to my Oyster is really simple, and other years everyone shakes their head and says "no, we can't do that here, go away". This year's attempt proved almost, but not quite, at the easy end of the scale. Fri 21: If you walk really quickly across Walthamstow Marshes, it is possible to reach the bandstand before the rain chucks it down. Nice rainbow. Sat 22: So there was one Open House venue I visited but never told you about, not because it wasn't amazing, but because there's only so many consecutive days you can blog about London buildings before hundreds of your readers drift away. Sun 23: I took off my waterproof jacket on the top deck of a number 77 bus and forgot to pick it up, and only realised halfway down the road ten minutes later. Gaaah. I did all the stuff you're supposed to do, contacting the garage with full details, but they got back to me later and said "sorry, we looked, but no". It wasn't the world's most expensive jacket, but if you found it without handing it in, I hope it doesn't fit. Mon 24: My youngest nephew has also reserved a property, but his is in Lancashire not London, so it's much larger than my eldest nephew's new flat and costs a quarter as much, so he wins. 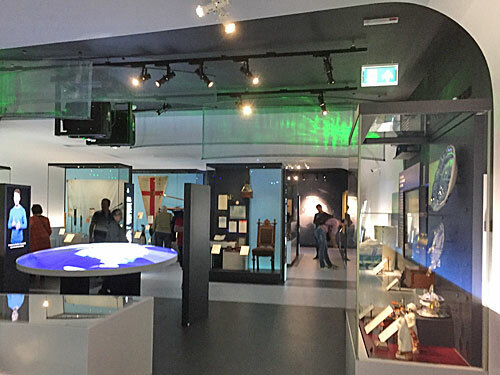 Tue 25: The four new galleries at the National Maritime Museum are good, my favourites being the Pacific Encounters and Polar Worlds galleries, which successfully manage to balance derring-do with the morality of Britons sailing overseas and exploiting everything. I was less impressed by the inaugural exhibition at the Science Gallery London, SE1, which didn't hook me for long. Wed 26: I took a farewell trip on the (current) Woolwich Ferry, whose boats are due to be scrapped at the end of this week. I bet the new boats won't include anywhere as grimly atmospheric as the labyrinthine passenger deck, which I always picture full of dockworkers and headscarved women sailing home in November fog. Thu 27: I stopped off at the Amesbury Heritage Centre, whose collection of mesolithic remains is second to none, and got told an awful lot about local airfields, but I fear I interrupted the volunteers sitting down to cottage pie for lunch. Fri 28: BestMate invited me round for dinner so we could catch up on that Netflix show neither of us subscribe to, but is readily available via alternative channels. Sat 29: Blimey, Cannizaro Park is gorgeous, a proper unexpected walled treasure accessed off the southern end of Wimbledon Common. I managed to avoid the wedding reception crowds at the big house, poked my nose inside the aviary, explored the shrubby slopes and found a seat in the Italian Garden to do the crossword while the sun blazed down. Ah, summer seems so long ago now. Sun 30: The Olympic Park remains busy at weekends, from top to bottom. The ghost road immediately to the north of the Velodrome has become a gathering point for moped crews doing wheelies. A barge and a narrowboat moored up near White Post Lane over the summer offering brunch, tea, canoeing and trampolining for kids. The lawn by the Orbit has been relaid, just in time to be ripped up and turned into a university. Where did that cold wind whip up from?